This past week saw the milestone first anniversary of Sticky Footprints' first Sticky Step pass, so it feels like a good time pause for a moment and process that fact. It feels pretty good, to be honest. It's true I haven't posted as regularly as I'd would've liked at times (and as I start to devote time to a few other passions and projects, that's not likely to change on the short term), but I've kept up with this blog pretty well and after a year with a post every other week on average I can safely say that isn't nothing. The hunter of Human-Lizards hanging out in front of the Art Gallery of Ontario. The constant challenge of course, has been trying to keep pace with both the ever-changing landscape of the city and the astonishingly talented and prolific output from the creator of The Pitiful Human-Lizard, Jason Loo (who can churn out a whole comic in just a little more than a week!) while living in the Niagara Region and rarely having the chance to visit the Big Smoke. Hopefully that will change in the coming months, since the plan is to be closer to the city anyway. In the meantime, I want to thank Jason again for approving of this little blog idea of mine and encouraging me to pursue it. Of course, I especially want to thank everyone who's been following along so far, as well. 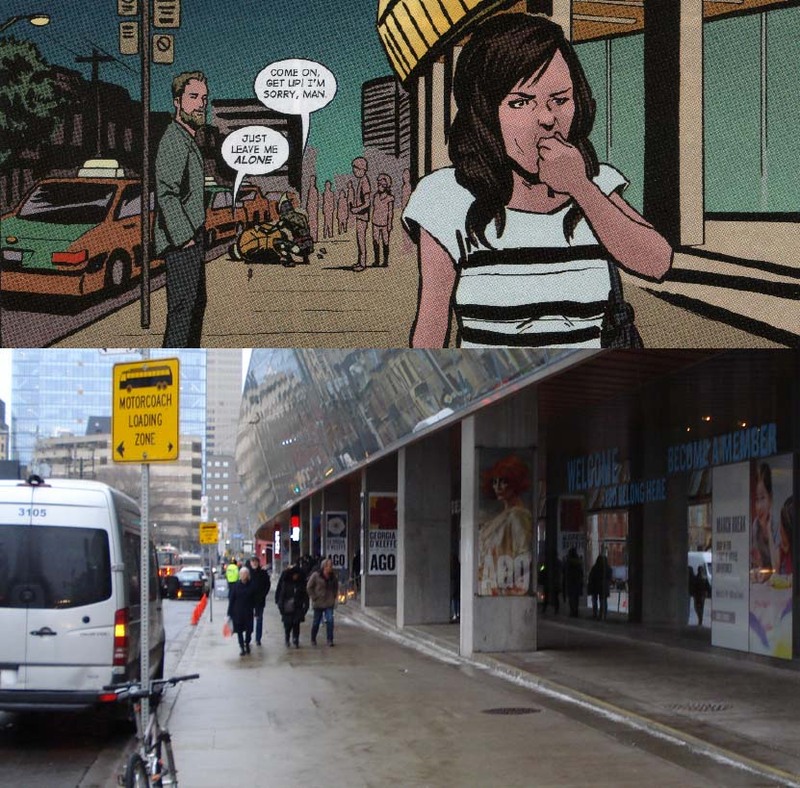 There's so much more of the Human-Lizard's Toronto yet to share, so I hope you'll STICK around for it! 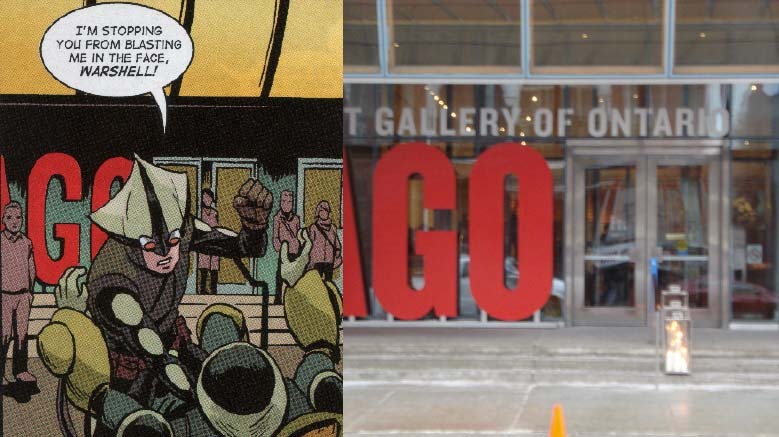 The Human-Lizard protects the AGO from Warshell. Continuing his patrol after the incident with Mother Wonder and the ROM's moon rock thief about a half hour earlier, Lucas descends from the top of the Art Gallery of Ontario's Galleria Italia facade to finally mete out some lizard justice to a small-time villain named Warshell attempting to steal the Tom Thomson painting, Sunset in Algonquin Park inside. 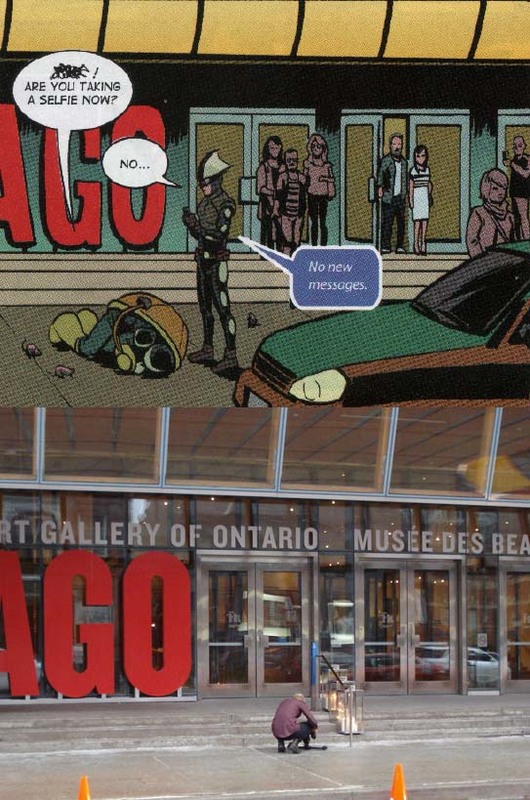 The AGO is safe enough again for Lucas to check his messages. Risking a blast to the face from Warshell's wrist rockets, the Human-Lizard bravely hurls himself at the would-be art thief and with a well-placed knee to Warshell's nether regions, the danger has passed and the AGO and it's art appreciating patrons are safe once more. 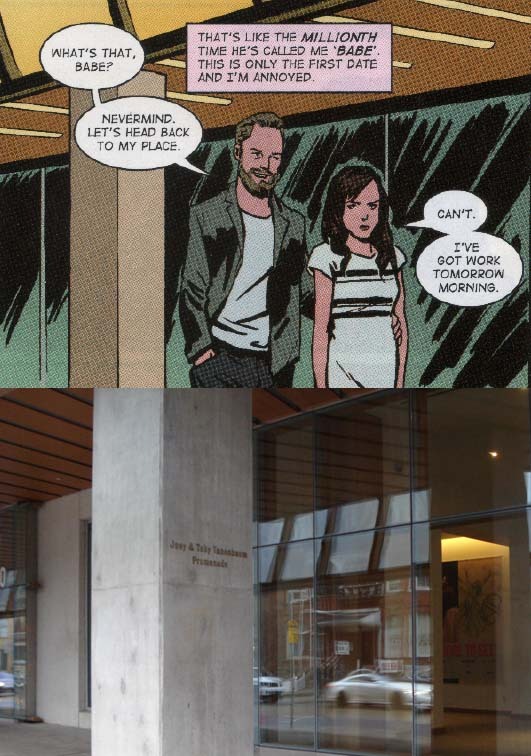 A certain school teacher and her "Don Juan" date exit the AGO. 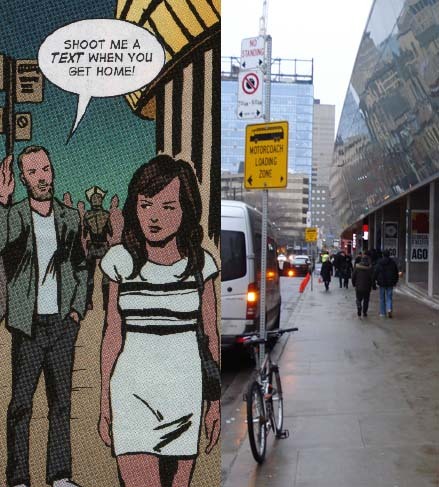 At that moment, as Lucas checks his messages for the millionth time with no luck, two people exit the gallery (one the same grade school teacher who was not impressed with her students admiration for the Human-Lizard in the first issue) and seeing the commotion on the sidewalk, start heading in the opposite direction along the AGO's front promenade on Dundas Street West. 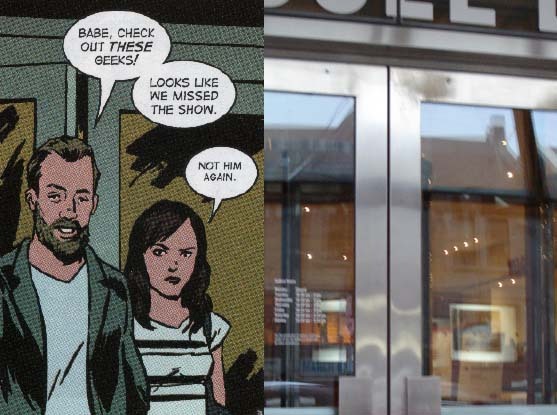 Taking a stroll along the Joey and Toby Tanenbaum Promenade. "Don Juan" gets a little too familiar with his date and losing all patience with him, she shuts him down and heads for home. Clueless as ever though, he tells her to keep in touch. After a bad first date with "Don Juan," best to just untangle yourself and run. Meanwhile, as she stifles a retch at the thought of ever communicating with this guy in anyway ever again, the Human-Lizard attends to Warshell, still curled up in a fetal position on the sidewalk, completely immobilized by Lucas' attack. Heading home fast while the Human-Lizard consoles a defeated Warshell. Although the Art Gallery of Ontario (AGO) was founded in the year 1900 (as the Art Museum of Toronto), it didn't settle into it's permanent location at 317 Dundas Street West until 1910, when The Grange (a Georgian manor built in 1817) was bequeathed to the Ontario Society of Artists upon the passing of the British historian and journalist, Goldwin Smith. After previously being renamed the Art Gallery of Toronto in 1919, the art institution was renamed the Art Gallery of Ontario in 1966. The AGO's Galleria Italia facade seen from the corner of Dundas and McCaul. In 2004, world-renowned architect Frank Gehry began a $275 million redevelopment plan, titled "Transformation AGO" to revamp and expand the gallery. 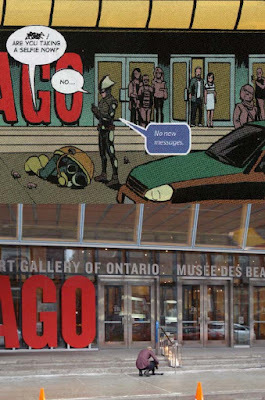 Reopening again in late 2008, the AGO now boasts a four-story glass and titanium south wing overlooking Grange Park, as well as the distinctive, 180 metre-long Galleria Italia facade along the gallery's north face on Dundas Street West. Up next: RooBarb heads home and the Human-Lizard finally gets a phone message while riding past The Great Hall, but after the events of the past evening will he have a date or not?